Alanda January 7, 2017 4 Comments This post may contain affiliate links. 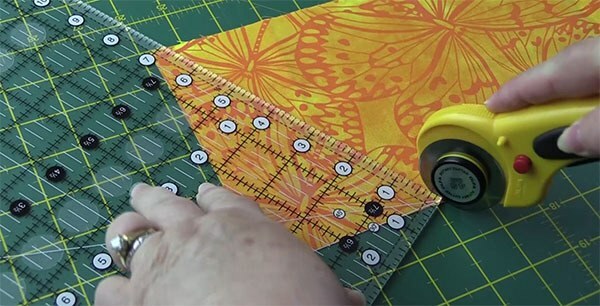 Have you ever wondered what to do with those angle lines are on your quilting ruler? 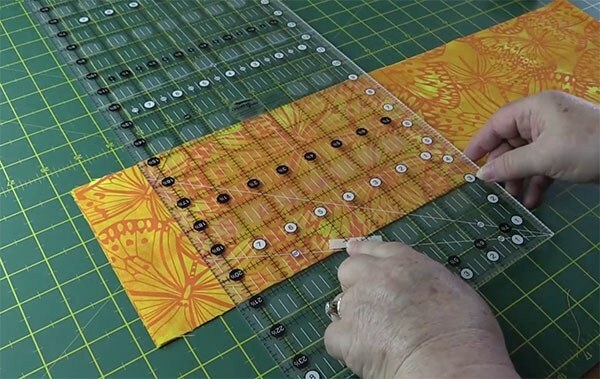 I know when I first started quilting, I had no idea what they were used for and just basically ignored them. 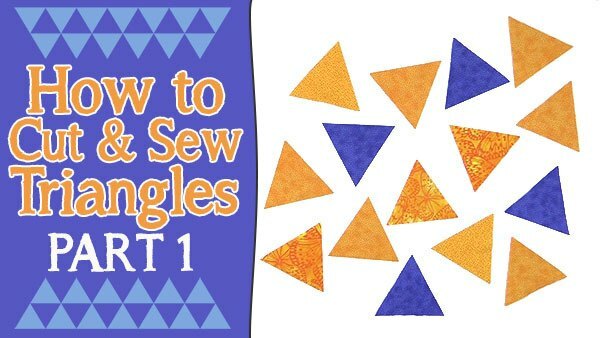 But when it came to cutting triangles for a quilt, it all became clear and I realised just what I was missing out on. I love triangle quilts. I love them because they are so easy to put together and they look awesome especially when you mix up the colours. 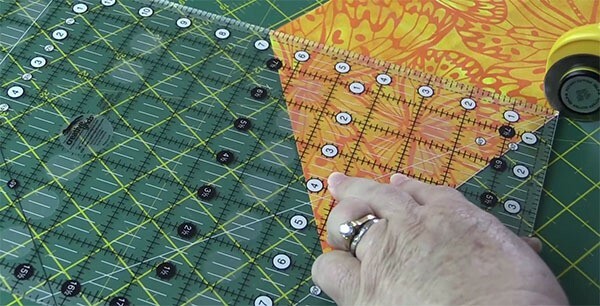 Using your 24″ quilting ruler, or any ruler really with a 60º line. 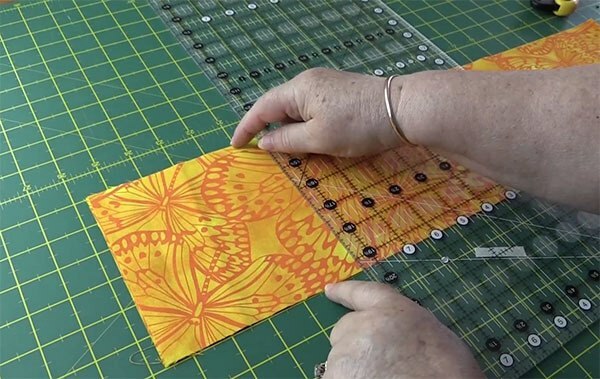 An alternative to Sew Easy is the Creative Grids Equilateral Triangle which also has excellent reviews. 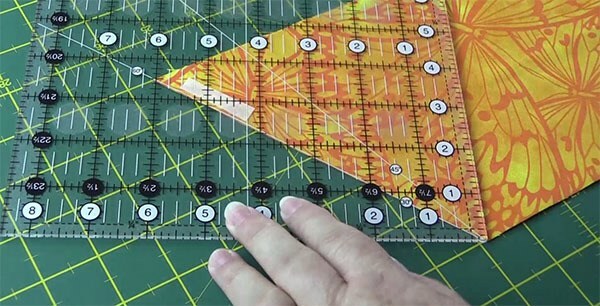 Start by finding the 60º line on your ruler. You can see in the image how the line runs from the bottom right hand corner upwards to the left. 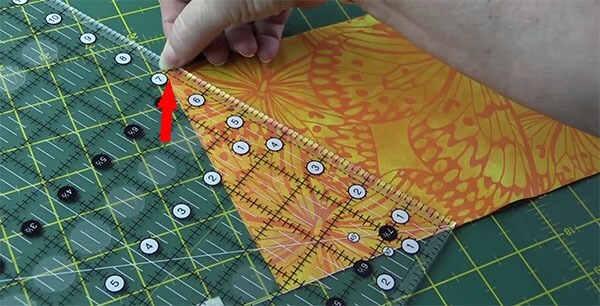 Once you have found it, it might be worth you adding a piece of masking tape to that line (like we have done in the image below) so it is easy to find again and you don’t confuse it will any other lines that might be on your ruler. 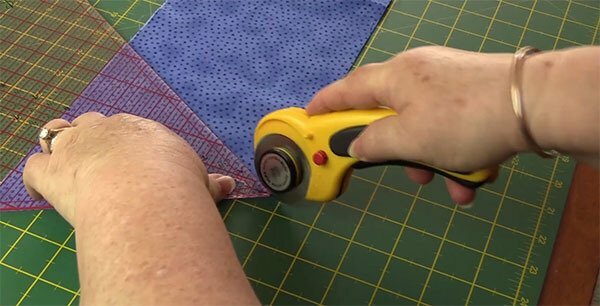 Cut your fabric to the width of your triangles. 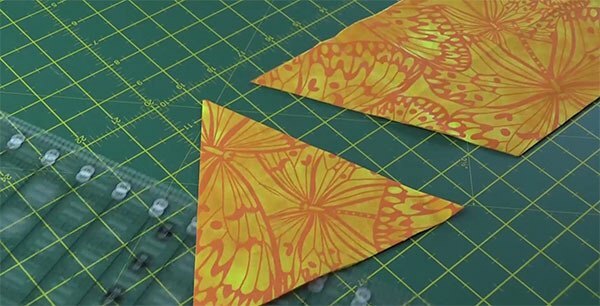 For our project, we wanted 6″ triangles so we cut our fabric at 6″ by the width of the fabric. 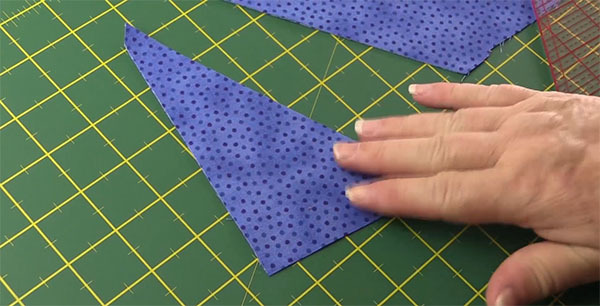 Place the fabric so that the selvedge edge is on your left and the folded edge of the fabric is on the right. The first thing we need to do, is to cut off the edge pieces. 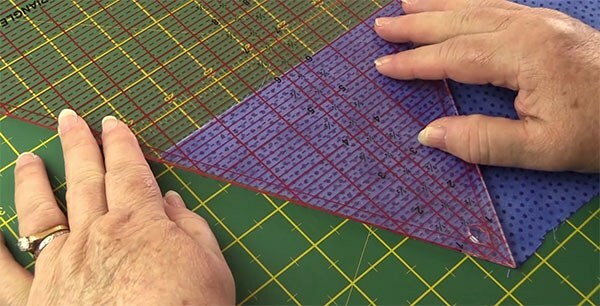 Turn your ruler so that the 60º line sits at the bottom edge of your fabric as shown in the image below. 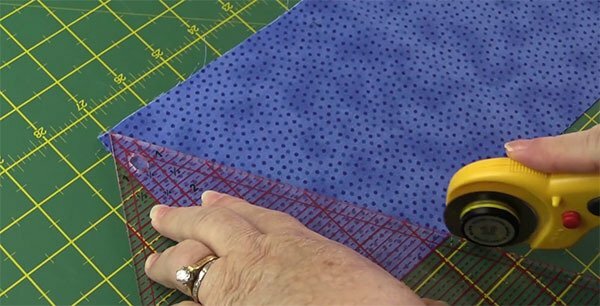 The left hand side edge of the ruler should line up with the top corner of your fabric. 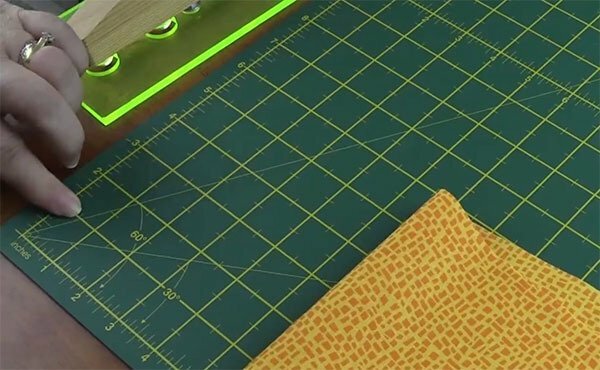 At this point, if you cut the fabric, the edge pieces will not be usable as they will not have a seam allowance. So decide now whether you want to use these pieces in your project or not. If you don’t need them, then cut away. 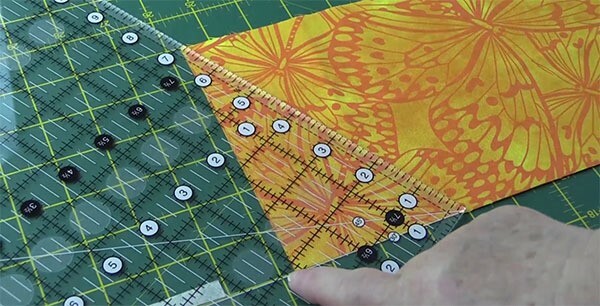 However, if you do need them then you will need to add a seam allowance. 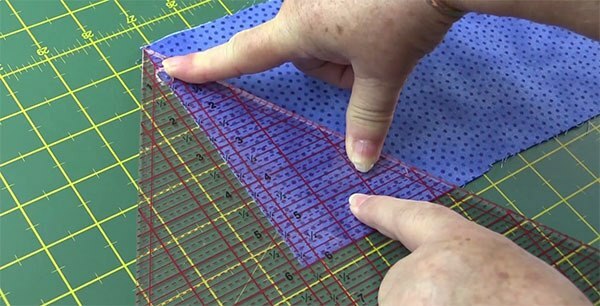 In order to add a seam allowance, move your ruler a quarter of an inch to the right so that at the top of the fabric you now have an extra quarter of an inch added. 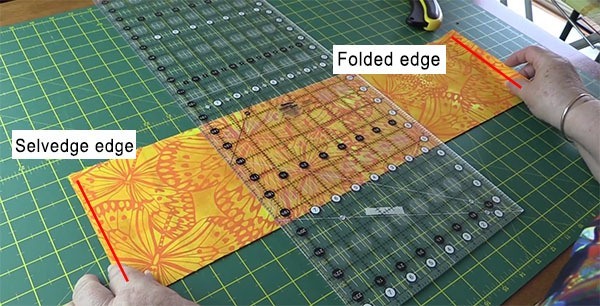 This will leave you will two edge pieces that you can use in your project. 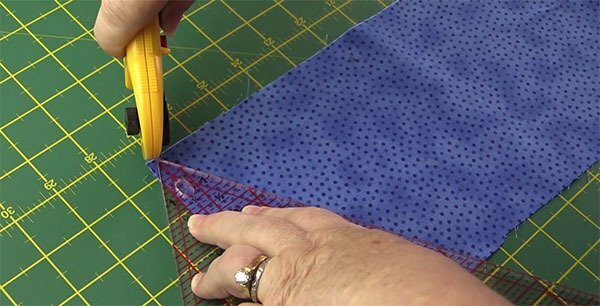 Turn your ruler so that the 60º line is on the line that you just cut and the point of the ruler sits at the bottom edge of the fabric. This will give you two full triangles. 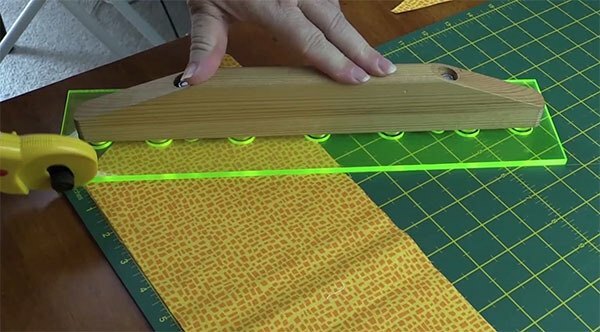 Now we need to turn the ruler again so that the 60º line is running along the bottom edge of the fabric and the edge of the ruler lines up along the top edge. Continue like this until you have cut the required number of triangles for your project. 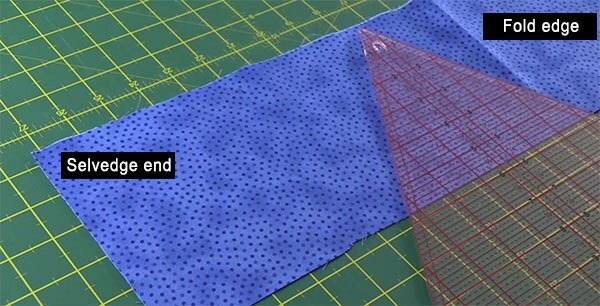 Place your ruler so that the top of the triangle is at the top edge of the fabric. 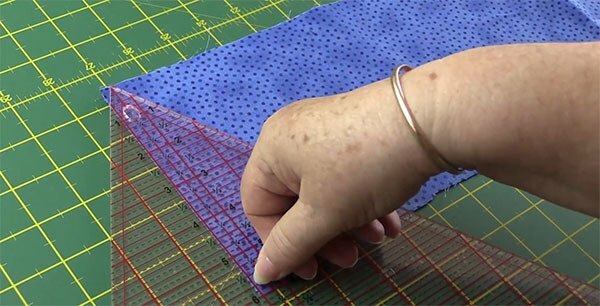 The bottom edge should line up with the width of your fabric. 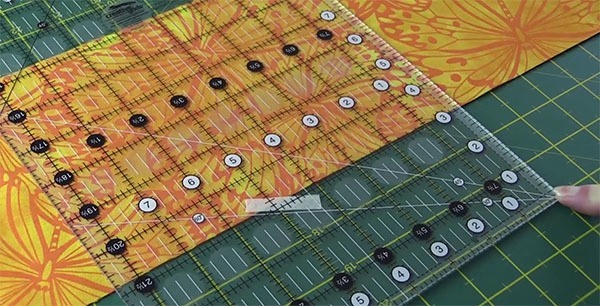 For example, our fabric is 6″ wide so the 6″ line of the ruler should line up with the bottom of our fabric. 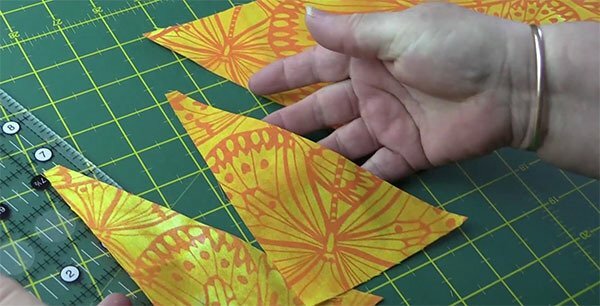 To add a seam allowance, move the triangle ruler slightly to the right until it lines up with the quarter inch line. You will also need to cut the little tab as shown in the image below. This will leave you with two half triangles that you can use in your project. 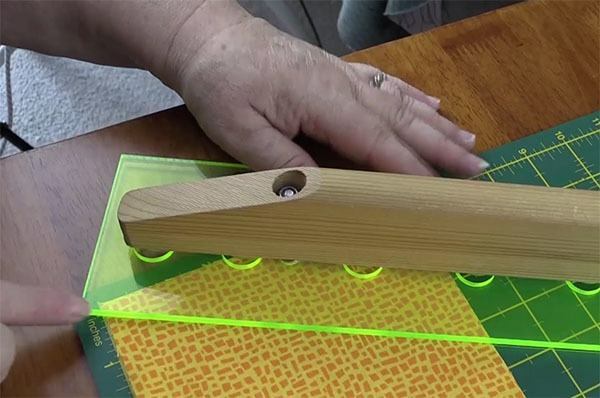 Now turn your triangle ruler so that the point faces towards you. Line up the ruler as shown in the image below. You will now have two full triangles. 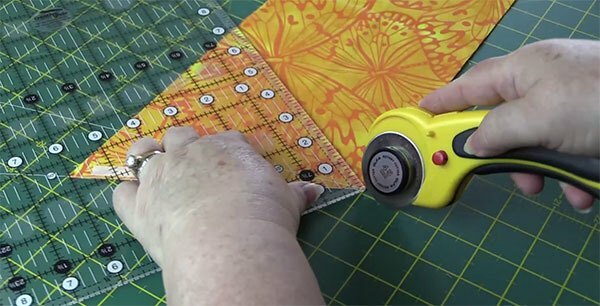 Turn the ruler so that the point sits at the top of your fabric. Cut and you will have another two triangles. 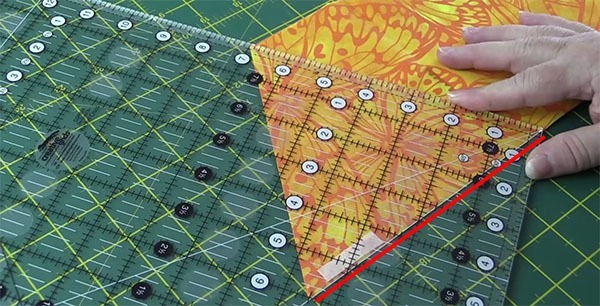 Continue turning the ruler until you have the required number of triangles for your project. 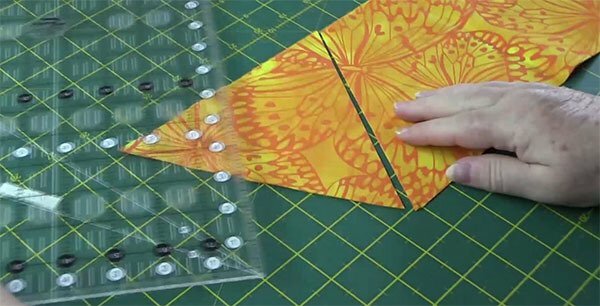 You don’t need any fancy rulers to cut triangles. 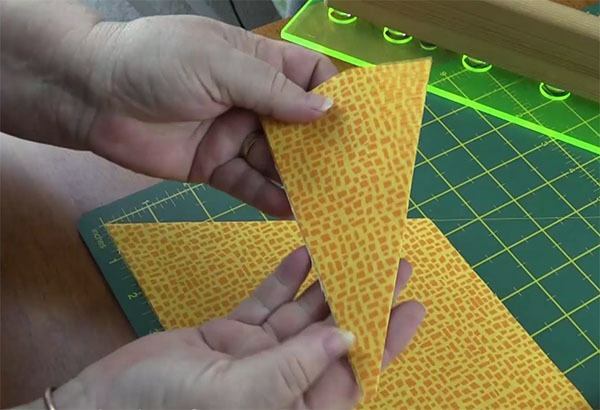 Assuming your cutting mat has a 60º line, you can cut still cut triangles. 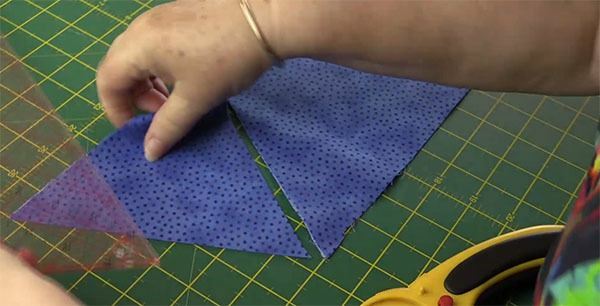 Start by cutting your fabric to the width of your triangles. 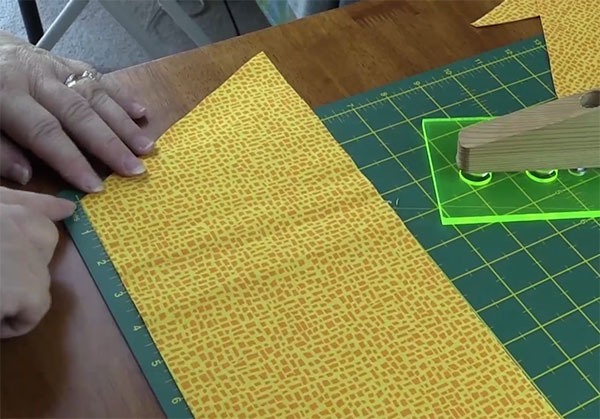 For our project, we wanted 6″ triangles so we cut our fabric at 6″ by the width of the fabric. 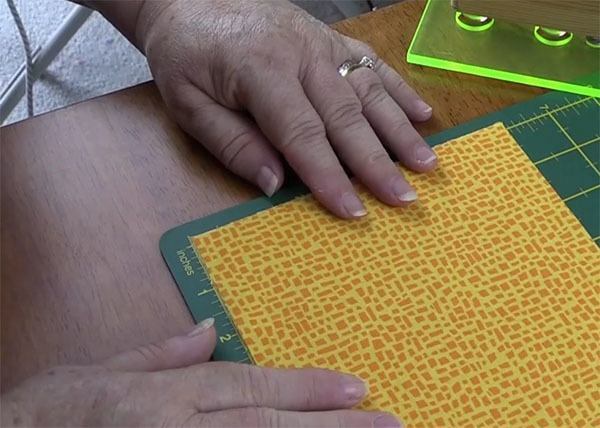 Find the 60º line on your cutting mat. 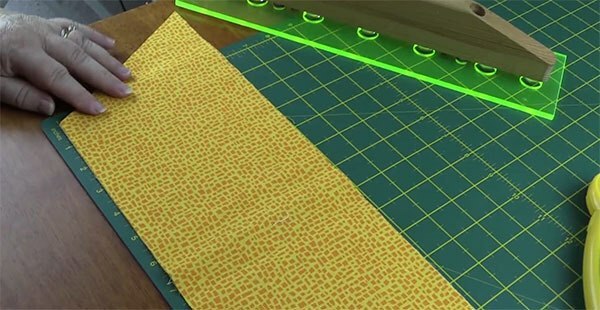 Place your fabric so that it lines up in the corner of the mat. Line up you ruler along the 60º line as shown in the image below. 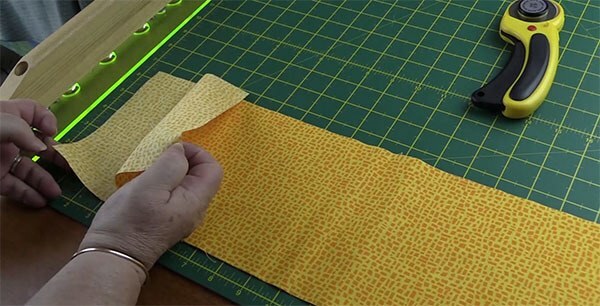 To add a seam allowance, move the fabric a quarter of an inch to the left. You will now have two half triangles that you can use in your project. 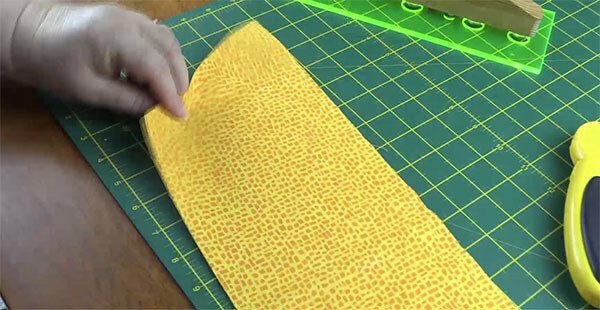 Now grab the top edge of the fabric and flip it over towards you. 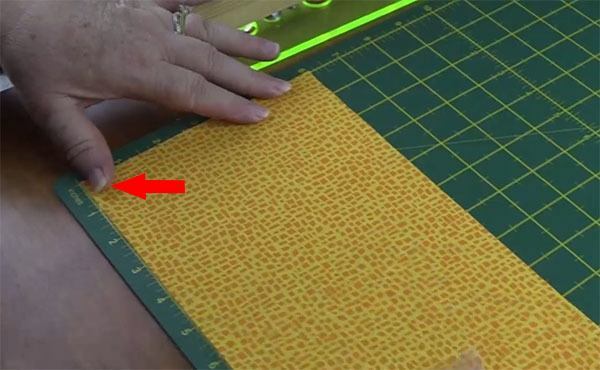 Line up the fabric to the corner of the mat as shown in the image below. 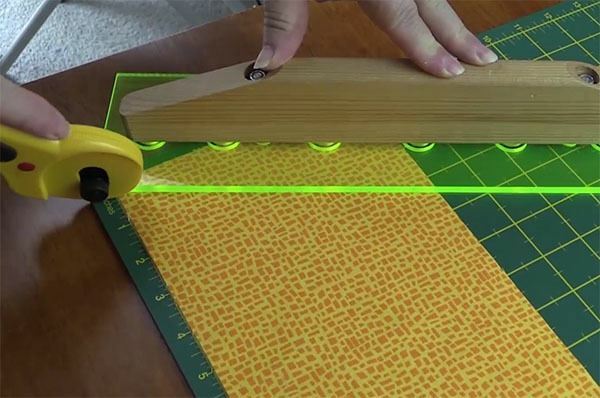 Line up your ruler on the 60º line and cut. Flip the fabric again towards you. Line it up again with the corner of the mat. 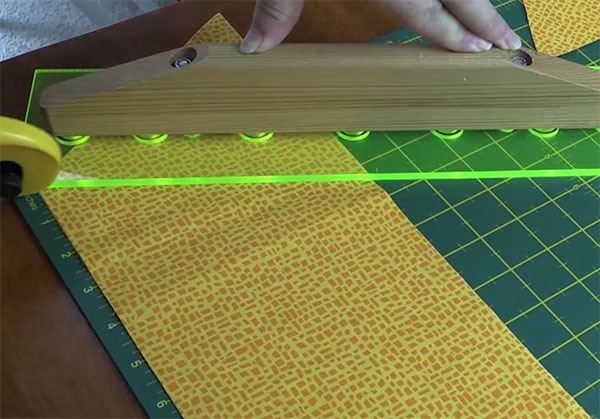 Line up your ruler with the 60º line and cut. 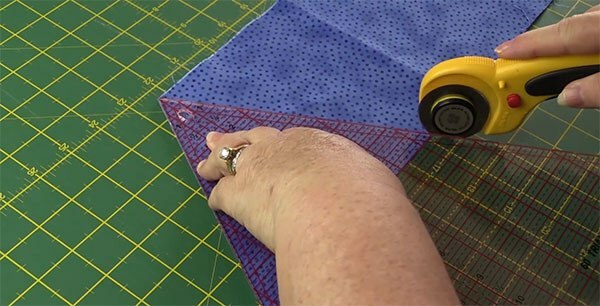 Continue to flip the fabric each time until you have enough triangles for your project. Great tutorial. Clear and easy instructions. Thanks for your lovely comments Suzanne. P.S. Wanda has recently lost a lot of weight and her rings are no longer tight fitting. They now come off naturally so she no longer needs to worry about having them cut off but thank you for your concern.